The rise in atmospheric carbon dioxide (CO2) levels must be halted to avoid further undesirable climate change. 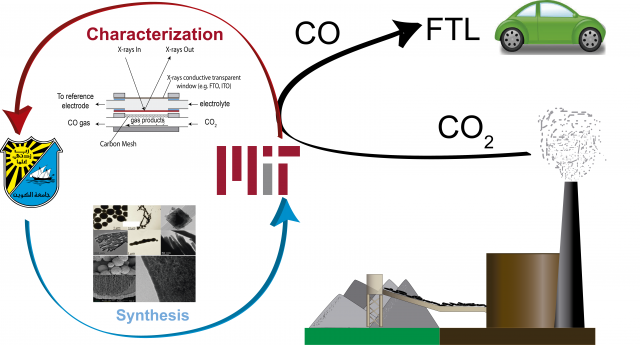 The electrochemical CO2 reduction to value-added chemicals, such as carbon monoxide (CO), represents a promising approach to developing carbon neutral cycles, via CO2 recycling, and to providing a means to storing otherwise wasted excess renewable energy from intermittent sources. A key challenge hampering the economical viability of CO2 transformations is the lack of efficient, selective, and durable electrocatalysts to drive the desired reactions. Specifically, current electrolysis cells accomplish either high Faradaic efficiency (often >95% product selectivity), or reasonable current density (conversion), whereas both need to be high for a commercial process. While significant advances have recently been made in the development of active and selective electrocatalysts, less attention has been focused on the stability and durability of these catalyst and electrodes under realistic operation conditions. Here, we propose to investigate the long-term stability of current state-of-the-art catalysts and supports and, based on these results, to design novel catalysts and electrodes structures with the durability required to efficiently operate at process conditions for extended time periods.